For this week's episode of Cool2Craft, I decorated a paper maché gift box using a variety of mixed media techniques. I just love shades of gold, copper and bronze together. Plus it's so fun to blend and layer rough and smooth textures - paper, sand, metal, acrylic, and glass. Click here for my project instructions and video tutorial...have fun! 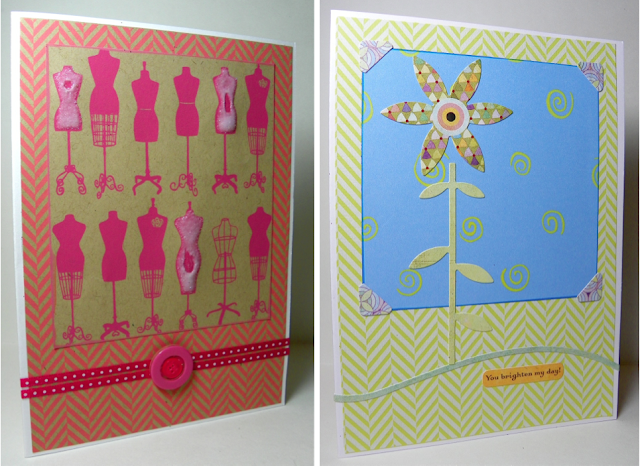 Just made a couple cards for friends to ring in the new year - I really like the black/white/kraft color combo. I made the embellishment to represent opening the door to whatever new and exciting opportunities might be ahead in 2013. Happy New Year! When my mother found a box of 1000 manila hang tags marked down to just a few dollars on the clearance rack at the local office supply store, she thought how handy they'd be for a garage sale. But we crafters usually see things a little differently, right? Red and white inks, glitter, glue, a ribbon and some bling turns a dozen of those tags into a pretty fan-shaped gift bow to tie around the neck of a bottle of wine. This was a fun one to make with a Smoothfoam ball and some silver thumb tacks....just paint and poke, lol. The ball has a seam line around the center that makes a perfect guide to keep the first row of tacks straight. I used a little Tacky Glue to add glitter on the bottom and a pretty ribbon in between, then I added a few decorative gold headpins just for ducks. Here's a super easy way to add a little something extra to a table during the holidays. I bought this rosemary plant at my local grocery store - it not only smells divine, it's a living herb that I can plant outside later and have delicious fresh rosemary to season my cooking. To decorate it, I just tied some jingle bells to a few stems with red embroidery floss. Then I punched some flowers from red paper and added a little red glitter with glue to the tips of each petal. I snipped a little slice between two of the petals toward the center of each flower to "wrap" them around the stems. Lastly, I cut some long narrow petals (like poinsettias) from the red paper, creased them down the center and just poked them into the plant in various spots...done! And so cute! Check out this Cool2Craft episode all about a fun project for the New Year. I used stamping and decoupage techniques to create a unique deck of cards that will keep me reminded of the good things I want to do in the new year. These would also be really fun to make and swap, like artist trading cards! 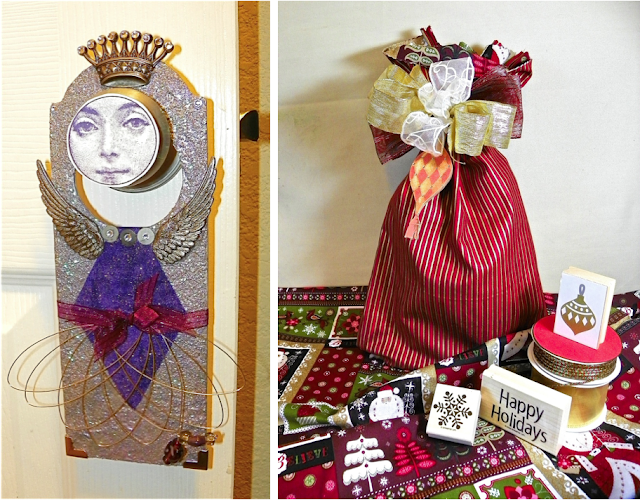 In case you missed my most recent segments on Cool2Craft...this week my angel doorhanger is featured, and last week my reversible fabric gift bag was featured. Full project instructions and the video tutorial are ready and waiting for you on the Cool2Craft site. Hey now, what a great gift idea...make a cute doorhanger to put in a pretty handmade bag! I signed up for a challenge from the Bit of Pink Heaven blog to create something using the items inside a surprise package from the Sigrid Studios Etsy shop. Inside the package was a lovely variety of vintage papers and ephemera, so I made this paper flower cone ornament. The cone itself is a piece of sheet music, and all the flowers were punched out of book pages and then colored with Pan Pastels. The leaves were colored and cut from Monopoly money. The circle embellishment is a tab from an old milk bottle that I glittered yellow, then I punched a smaller circle from a playing card and added clear glitter to it. The orange ric-rac that the cone is hanging by was part of the package too. The only things I added that were not in the package are the rhinestone centers of the flowers. I still have lots of pretty papers leftover - many thanks to Eleanor and Tanja for the treats and the challenge, it was fun! 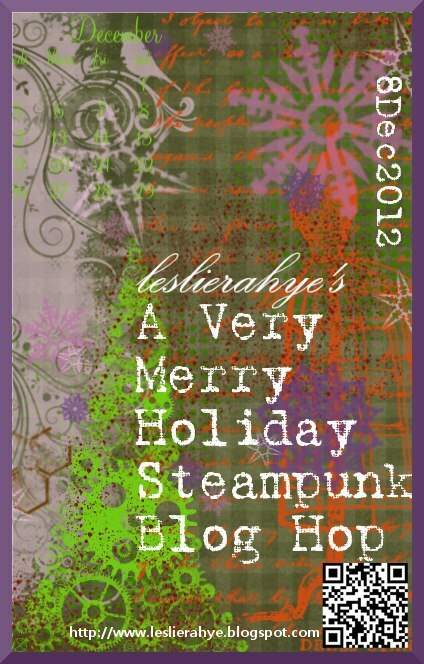 Leslierahye is hosting another steampunk blog hop and it's very merry! This collage is steampunk-light, but I really enjoyed making it...I especially enjoyed burning the paper all around the edges...mwah. I bought the original pic of this little victorian boy from an antique store, I just love him. It cracks me up how stately and mature he looks in this pose, when he was probably all of seven years old. But he's extra cute with his glittered santa hat and boots. The trees, hat, swirls and stars are Tim Holtz Grungeboard, inked with Pan Pastels. Enjoy the rest of the hop using the links below! Twice a year I go to CHA - the Craft & Hobby Association Conference & Trade Show. This is a big note-taking, card-taking, deal-making, hand-shaking, inspiration-quaking show for me. Sure, I have an iPad and a laptop on my person, but I'm still a pen and paper gal when it comes to my travel agenda, the seminars I attend, the appointments and commitments I make, ideas and inspiration I want to remember. Usually I take a steno pad or a small spiral notebook, but they don't look very professional. I've taken an art journal and colored pencils, thinking I might enjoy some quiet creative time at the show in between notes and agendas, but that's virtually impossible because every minute of every hour for four days is mapped out with people to see, places to go, things to do. I've never gotten into the complex planner systems notebooks either...too much muss and fuss and preprinted templates that I don't need, not to mention they're expensive. Enter Martha Stewart Discbound Notebooks. The good people from Martha's home office team sent me one of these notebooks with a few accessories to review (they're available at Staples). At first I thought, meh...another binder-style notebook with lined paper, a nice heavy cover and a pen holder. But then I looked more closely and realized the whole "discbound" feature in the spine was pretty cool. All the pages and divider tabs pop in and out of the disc rings like Rolodex cards. So you can move pages or tabs around, take them out, put them back, way easier and faster than with a 3-ring binder. Plus this solves one of my huge pet peeves with tearing out pages from spiral bound notebooks...I hate all the messy little paper bits stuck on the other side of the spiral. One of the accessories are these narrow little to-do list papers that come on a pad. You can stick one wherever you need it, and the top peeks out above the note sheets. I started thinking about how I take notes at the seminars I attend. There's the stuff I write down just because the act of writing what I hear helps me retain the information I'm learning. Then there's the info I want to actually do something with later, like visit a website the speaker recommended, or sometimes the topic reminds me of something else I need to do or try after the show. So I think these little to-do slips are going to be very handy to insert next to my notes for safekeeping, then they'll be so much easier to find later, instead of reading through all my notes looking for where I put something in all caps or underlined it. Then there are the sheets in between seminar notes, where I'm doodling or designing or jotting down plans for that next big idea...which I can easily move to a separate section whenever I want. So I gotta say, this little notebook will be my perfect "command central" for CHA in January, and it will come in handy for client meetings right now. It's a nice size for my big purse, and all the accessories and refills are less expensive that some of the other planner systems. The note sheets glide smoothly along the discs without coming off (for turning pages), and they could easily be used like a daily appointment calendar. It has a couple pockets to store business cards and such, plus a nice elastic band to hold it closed. Thanks Martha! Want to save the world from blah? Of course you do! 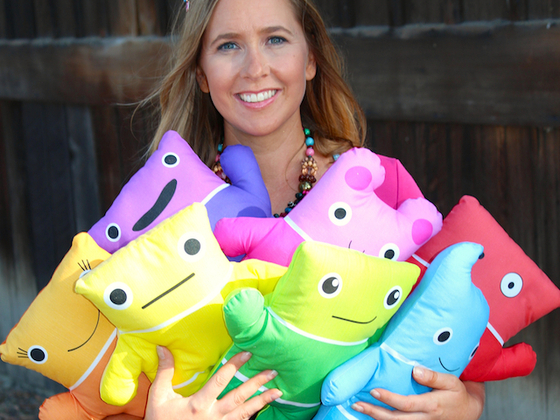 My creative crafty besties, Andrea and Cliff, have designed a collection of seven softies (aka plushies, stuffies, pillows) that look like paint chips. Each of the seven softies is a colorful character with his or her own personality, complete with a super cute name, individual style, and even a background story. You have the opportunity to join the Paint Chip Pals fundraising campaign on Kickstarter...kick in a few bucks to help the Pals get from the prototype phase to the production stage, and you can get a Pal for keepsies. The Pals are intended to inspire us to use color in our work, in our homes, in our lives. I am guilty of ignoring color. My wardrobe is mostly black. My home decor is mostly neutrals and darks. My creative work leans toward metallics and earth tones. So I stepped outside my comfort zone and made some brighter, more cheerful greeting cards inspired by these pals o' mine. 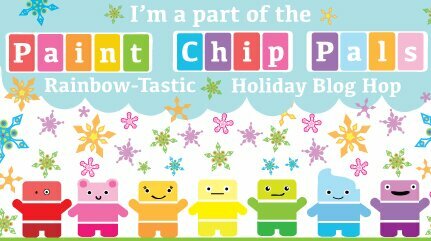 Click here to see how the other bloggers in the hop got psyched about color, and be sure to leave a comment here on my post and on the other posts in the hop for your chance to win a Paint Chip Pal of your very own! It's the first Monday of the month, and that means it's time for a blog hop with the Designer Crafts Connection! When you're done here, click on either of the "hop" links in the DCC logo in my sidebar to go to the next blog. When you get there find the same logo on her blog and keep on hoppin' in the same direction. This month our theme is "Handmade Holidays" so I decided to make a tree ornament with a 2.5" SmoothFoam ball. First I painted it green and added some clear glitter. Then I grabbed a bunch of pretty green stone beads and short headpins and just started pokin' 'em in. After a while it was easier on the tip of my finger to use a metal thimble. For the beaded pins at the top and bottom, I sank those in clear glue first for stability. I love the two glass millefiori beads at the bottom! I made it red and green so it seemed like a Christmas ornament, but I added the hints of yellow so it didn't look too Christmasy. Now I can hang it anywhere all year long. that's what i love about encaustic painting... it's an experiment every time. it's so relaxing to paint and melt and carve and layer without really knowing exactly where you're going with it. wax is pretty forgiving too. if you don't like it, use the heat gun to morph it into something else. this is a small piece i created over the weekend. it reminds me of coral reefs under the sea at sunset. there's a piece of dotted scrapbook paper underneath the first layer of yellow wax and i used pan pastels to add extra color. i was trying to get a nice impression of little circles across the bottom using a strip of sequin waste as an embossing stencil, but it kept coming out wonky. so i decided to just embrace the wonk and continued to dry-brush the wax one layer at a time over the little tidbits until they were built up nice and high. 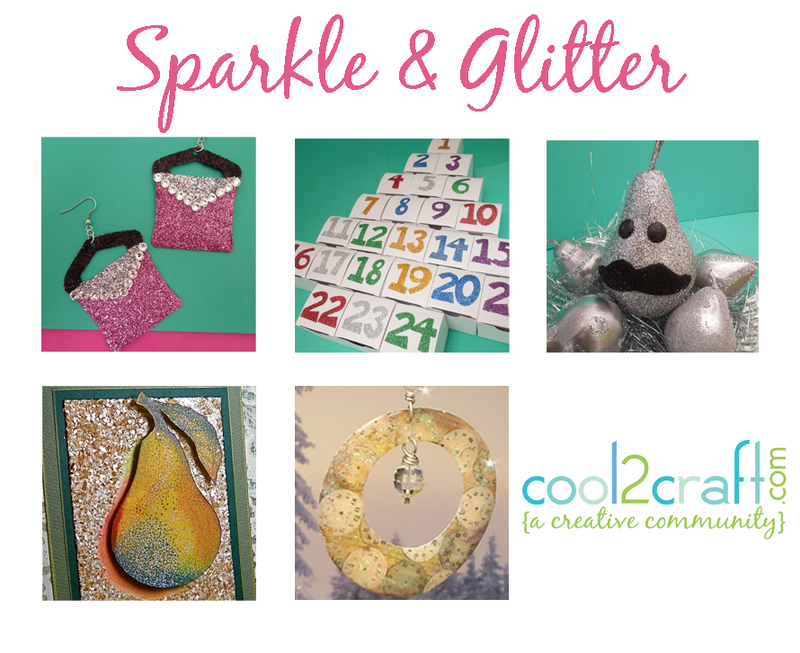 this week on cool2craft, it's all about sparkle and glitter! on my segment, i show you how to enhance a simple stamp image like this pear, and then make it literally pop out from a gorgeous panel of gold mica flakes. click here to watch the whole episode any time this week on the cool2craft channel. click here for my project instructions, and click here to watch my video segment on youtube. one of my craft how-to video tutorials was featured today on a show hosted by my friend rebecca on the mom tv site - how to make an easy holiday gift tag using upcycled christmas cards. i've been saving the christmas cards i receive for many years...i re-purpose them into new handmade cards and tags. my favorite way to do it is by punching out random parts of the card and creating little window pane mosaics. click here to watch my video for making these gift tags. click here to see a recent window pane greeting card i made. 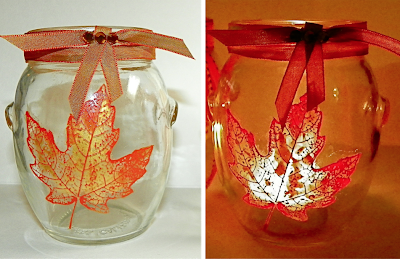 make this decoration for your holiday table with fall leaves collected from your yard or neighborhood. i love using the extra-fine glitter so it sparkles and looks icy cold. this was fun and easy to make—i love how it looks on my table! i just made 40 of these little souvenir tags for the attendees of the 3rd annual seaside soirée mixed media art retreat in southern california next month, hosted by charity wings and sponsored by several of your favorite art and craft manufacturers. there are still a few open spots, if you'll be in the area, click here to check it out! wonderful sponsors and instructors in a beautiful seaside setting. your registration fee will benefit good causes too—the charity wings art center and the scripps institution of oceanography. i used some of the tropical travelogue papers from graphic 45 along with dimensional shell stickers from k & company. seaside is everyone's best side! last night was our monthly get-together with my arty crafty friends. we had fun at uni's house eating and yacking, oh and also collaging and stamping new covers for mini notebooks. i worked with vintage sheet music, distress inks, and a few of my favorite stamps, all sealed with mod podge. i used a multi-color ink pad for the fleur-de-lys stamp, and then coated it with dimensional magic for a raised glossy effect. next month is at my house, we'll be playing with heat-embossing stamped images. perfect for my purse at just 3.5x4.5 inches. 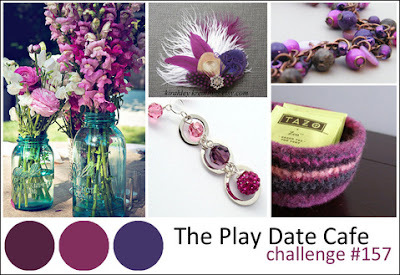 this week over at the play date cafe, the inspiration colors are plum, fuchsia and wisteria. the panel on this greeting card is made from thin hand-dyed fabric that had been torn into ribbon strips. the fabric has a little velvet and some metallic thread running through it. i fused the strips to a piece of clear organza with lightweight fusible interfacing. the background is a textured tissue paper called maruyama. i embellished the card with buttons and some trumpet and seed beads strung on a thin wire. painting on smoothfoam—plus a giveaway! we creative junkies in the designer crafts connection are playing with smoothfoam! when you're done here, click either "hop forward" or "hop back" under the designer crafts connection logo in my sidebar to visit the next blog with a fun project. look for the same logo on their sidebar and keep on hopping! smoothfoam comes in sheets and balls and it has a really nice surface for painting and gluing, but it's still soft for cutting and poking holes like regular craft foam. i used the 2" balls to make little holders to display the greeting cards you receive. super easy and cute! 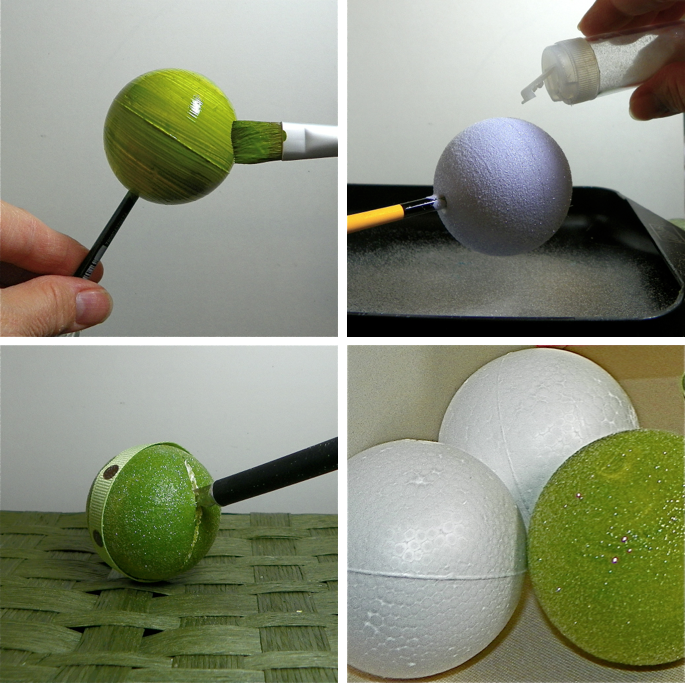 1. stick the end of a skewer or paint brush into the hole at the bottom of the ball. this makes it easy to spin between your fingers as you brush on the craft paint. depending on the opacity of the paint, you may or may not need two coats. 2. while the final coat of paint is still wet, sprinkle fine clear glitter all over it, tap off the excess, and pop the skewer into a glass to let the ball dry. 3. carefully slice a line in the top half of the ball with an exacto blade; the length of the blade is the perfect depth for holding a card. carve the line a little wider and use the tip of the blade to dig out a little of the foam. 4. glue some ribbon and bling around the center seam of the ball. 5. glue a circle of pretty paper to a large metal washer, then glue the ball to the center of it. to enter the giveaway, leave a comment here on my blog, and also leave a comment on as many of the other blogs in the designer crafts connection as you want...a comment on each blog equals more chances to win a selection of smoothfoam in a kit to make an adorable snowman! follow the designer crafts connection on facebook, and check out smoothfoam on pinterest for more ideas, too. this is something i started many months ago and i really want to finish it...improvisational piecing is pretty fun, you just cut and stitch and design as you go. i'm combining hand-painted fabrics with commercial fabrics and we'll see how it all ends up! i'm having fun today with clear microbeads, gold mica flakes, a multicolor ink pad, a dauber, clear gel glue and dimensional gloss medium! 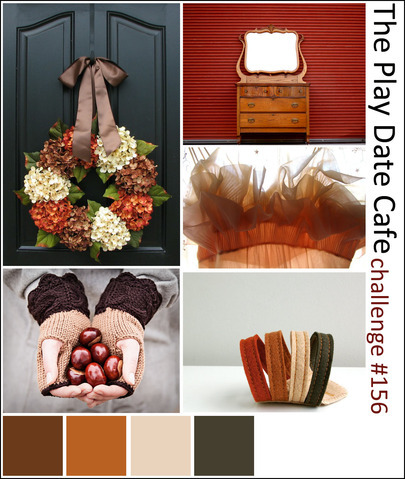 i found a new weekly craft challenge blog that i like called the play date cafe. this week's color palette to work with is cinnamon, squash, vanilla and sage. this 3.5" x 5.5" card was an experiment in surface design using the circular shape of a small fingertip dauber sponge and pigment inks. press hard for darker color, press lightly for a hint of color. i've also been obsessed with pears these days...eating them, drinking the juice, as well as stamping and embellishing them in my work. i just love the pear shape, don't you? click here to see my video tutorial to learn how to make the pear embellishment. november has been deemed by the literary world as a time to write...and i'm going for it. i've always enjoyed writing in general, for both business and pleasure, but this will be my first time venturing into the land of the novel. i joined nanowrimo for some motivation. their challenge is to write 50,000 words in this one month, without editing, just freeform writing...that's over 1660 words per day. i have begun today so far with just under 400, with more thoughts swimming around in my head to noodle on and write down tonight. 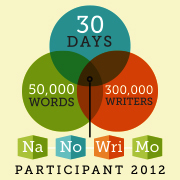 the nanowrimo site has word count tracking, online tools, and meet-ups to join other writers in your area. i'm hoping the whole process will be rather meditative. we'll see if i can keep up! in the meantime, i wanted to share my re-do of my artist trading card wall in my studio. i took the handles off my atc trays and nestled the trays all together on the wall with velcro® brand sticky back™ tape. the whole grid measures 3 feet by 7 feet. it's 252 little bits of pure inspiration. i just love the impact it has on me. this is the wall i face when i'm on the computer. not only is it a treasure trove of beauty, color and texture that i've collected over the last few years from over 200 talented artists and crafters around the world, it's like those people are right here with me, prompting my imagination. it also reminds me that for every one of these cards that i have, i made a card for someone else. it's a creative collective energy wall...i just love it. i'm finding it's a great place to rest my eyes while i'm thinking about what to write, too. this is a quick breakfast to make on a sunday morning and it's even pretty healthy with lots of fiber and less sugar because it's not drowned in syrup. i use all-natural ingredients; organic whenever i can. core and slice an apple and lay slices on a piece of foil. sprinkle with a little brown sugar and drizzle with a little honey. bake in toaster oven at 350° for about 15 minutes, turn apple slices over and bake a few minutes more until soft. if you're using a regular oven, times may vary. while the apple is baking, spray a large non-stick skillet with a little cooking spray and preheat to medium-high. mix 3 eggs well in a cup with a splash of milk, pour on to a dinner plate. dip each slice of bread in the egg mixture, thoroughly soaking/coating each side. transfer to skillet and fry on medium-high heat for a few minutes until each side is golden brown. spread a little cinnamon butter on each slice of french toast, cut in half diagonally and arrange 3 pieces on a plate. Add baked apple slices on top, drizzle with honey, and sprinkle dried cranberries. serves two at 465 calories per serving. i think what makes it easy is the pre-blended butter and also using my toaster oven. enjoy! 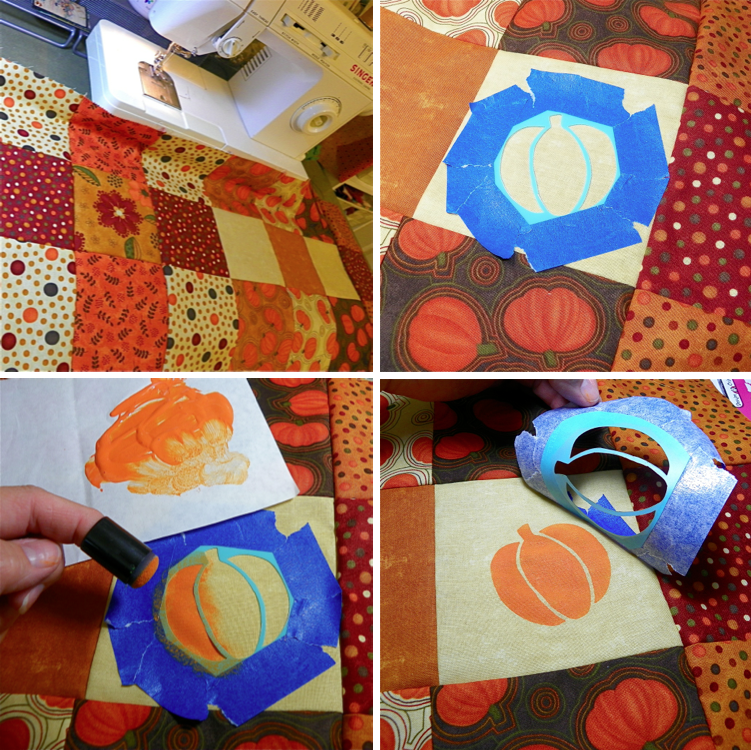 1. dust off the fabulous die-cutting machine you just had to have (but haven't used in years) and clear off a nice big open space (yeah, right) to work on your kitchen table, dining room floor, or perhaps the top of your dryer in the garage. then dig through several drawers looking for that one cartridge that you remember had some cool shapes. once you find the cartridge, you're not through digging. you still need to find the sticky cutting mat and the little rubber keypad cover so you know which key to press for the shape you want. 2. curse just a tad when you realize your cutting mat has lost all its stickum, then do a little dumpster-diving to find that 40% off coupon that you tossed because you thought you needed more craft supplies like you needed a hole in the head. 3. drive to the craft store and fight the halloween crowds in the aisles for about fifteen minutes, then march to the checkout line feeling pretty good because you snagged the last sticky cutting mat hanging on the hook of their woefully understocked display (because that's just how old your machine is). 4. after waiting more than twenty minutes in line with "mommeeeee i don't wanna be a farmer for halloweeeeen" ringing in your ears, curse just a little more (under your breath while you smile) when the clerk explains why your coupon cannot be used on the mat. 5. leave the craft store with your full-price sticky mat, while shoving a snickers bar into your mouth that you bought for 40% off. before driving out of the parking lot, take a moment to appreciate the marketing genius of placing chocolate bars at the registers in a craft store. 6. once you're back home, curse a wee bit more as you try to remember how to program the machine to cut multiple quantities of a variety of shapes to fill up the whole sheet of paper, so you can go another couple years without having to use the machine again, but still feel good about your brilliant advance planning and multi-tasking skills. while your machine is buzzing away, you can trim a sheet of card stock to size for the front of a greeting card (mine is 4.5"x6.5") and prep it for the spray adhesive and glitter (see instructions here in my last post). 7. try to stay calm, in spite of a sugar high, as you carefully try to peel dozens of skinny little die-cut shapes off a very, very sticky new mat without tearing them. be very, very thankful for the little mini spatula that came with the machine, which you initially thought was the silliest craft tool ever. 8. lay the salvageable shapes (mine are rings) on your card stock as desired, in position for spraying adhesive. even though the spray coats better when you hold the can vertically, i opted for the shake, spray, spurt and repeat method of holding the can horizontally, so i could leave the card and rings laying flat. 9. once you have sprayed the card with enough adhesive, dart over to the open window to take a few gulps of fresh air, then run back to your card and dump, i mean sprinkle, a crapload of fine glitter on top of it, while the adhesive is still nice and wet. 10. move the card out of the glitter pile to a clean space, and using a pair of tweezers in each hand, carefully extract the rings, tap off excess glitter and set them aside to dry. then pick up the card, tap off the excess glitter and set aside to dry...takes about thirty minutes, depending on how much you sprayed. take a moment to revel in the beauty of the negative space on your glitter card. 11. now quickly brush all the excess glitter onto a creased sheet of paper and pour it back into the glitter jar, before your sugar high wears off and sends you crashing into that "i'm too tired to clean-up" frame of mind. trust me, you gotta clean up glitter immediately. i have worked around piles of excess glitter for three days before and it just gets everywhere, including places i'd rather not mention on a family blog. 12. once your card is dry, use a soft, wide paint brush to gently wipe away any last bits of stray glitter and embellish your card as desired. i glued on a couple of the glittered rings and added a gold sun button. now you can send a sparkly sentiment to someone special...see now, wasn't that easy? as many of you are, i'm a fan of aleene's original tacky glue from way, way back. now there are so many aleene's glues and adhesives to choose from—wet, dry, clear, sprays, tapes, dots, some for paper, some for fabric, heavy-duty, fast-drying—it's quite a comprehensive line. i've become especially fond of the clear gel tacky glue for my cardmaking. it's great for glittering and also for adhering small or narrow embellishments because it's clear, strong, and the bottle has a small pointy tip. then when i was on craft wars, one of the most fun things we did was glitter a denim-covered tree trunk using a spray adhesive. so of course i was thrilled to see a can of aleene's crystal clear tacky spray in my box of supplies from i love to create! i recently got a couple bat diecuts from an atc swap that i wanted to use while the occasion is upon us, plus i wanted to try using the tacky spray with a mask (pun intended) to glitter up a background for a halloween card. so here we go...trick-or-treat...glitter my feet! - use a tiny piece of folded painter's tape to temporarily hold your mask in position on top of the front of your folded card (use another bit of tape to keep card closed too). choose a color of card stock that complements the color of your glitter. I used a gray card with black glitter. - on small projects, you can keep spray adhesive contained by spraying it inside a grocery bag, and you should work near an open window. - the can sprays best when holding it straight up, so another little piece of painter's tape on the back of your card will keep it on the bottom of the bag so you can set the bag on it's side and make the card vertical. 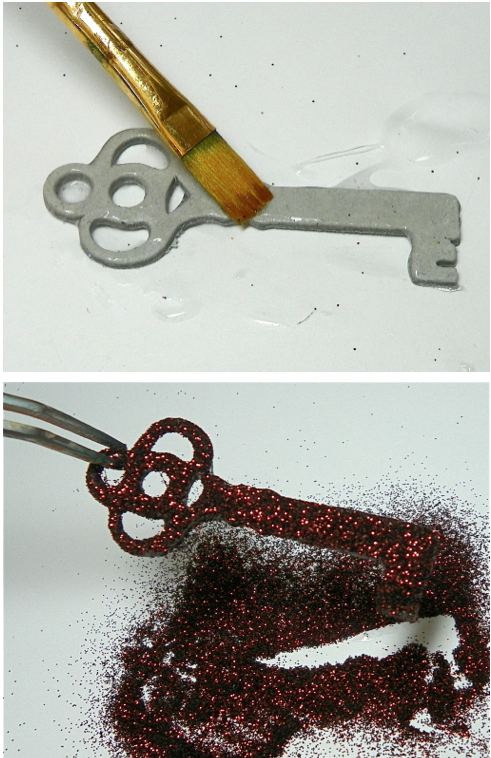 spray the card evenly and rather generously with adhesive, then quickly pour on the glitter. - i learned that if you don't get good enough coverage of the spray before adding the glitter, the glitter will stick at first, but then you can easily brush most of it off after the adhesive is dry. my first attempt might have become an epic craft-fail, but turns out i actually liked how the random puff of glitter that i was left with looked kinda smoky and eerie around the keyhole mask. - on my second try with another mask, i did achieve a lovely solid glitter coverage that stuck - but more on that in another post. today i am celebrating how to turn a mistake into a design opportunity!! - i covered some of my embellishments with aleene's clear gel tacky glue, poured orange glitter on them, and set aside to dry. - for the masked card with the puff of glitter smoke, i dabbed a sponge on a purple ink pad and gently rubbed some color around the smoke. then i edged the card with a purple marker, and used aleene's clear gel tacky glue to attach my embellishments. (i used a little black foam adhesive square under the left side of the key to balance it). 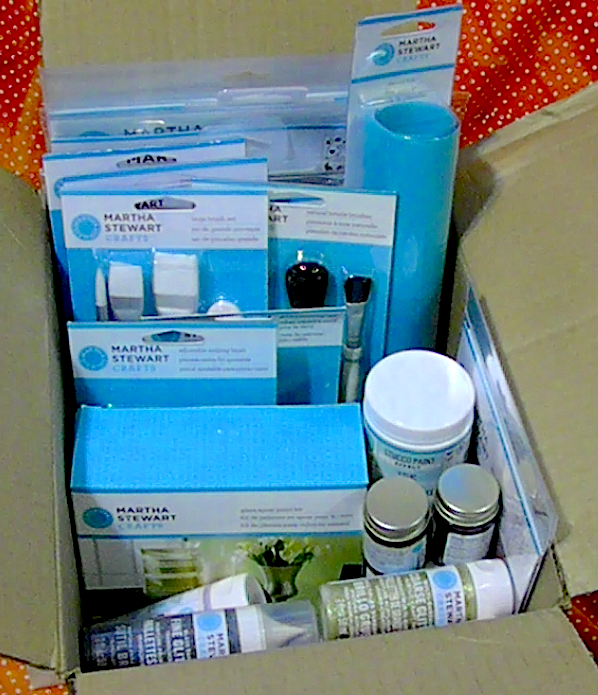 i'm looking forward to trying more of the aleene's glues and adhesives from i love to create! check out all these other great projects using aleene's! painting a glass jar + martha stewart crafts giveaway! so i really love these peaches that come in these super cute little barrel-shaped jars, and i really love those little fake flickering battery-operated tealights. eat the peaches, paint the jars, and you end up with some super cute (and safe) candle holders! i used the new glass paints and pattern tape from martha stewart crafts. this low-tack pattern tape has a little bit of stretch that regular painter's tape doesn't seem to have. i was able to give the strips of tape a slight curve as i applied them, which gave me stripes that were skinny on top and wider in the center, to complement the jar's shape. the glass paint goes on nicely with a fingertip dauber and becomes nice and bright with a second coat after the first coat dries. the bottles have a pointy dispenser cap that was perfect for squeezing a tiny bit paint right on to the dauber without needing a palette. the cap also worked great for dotting a little pearly border along each stripe. to cover the threads for the jar's lid, i painted the back side of a piece of filmstrip ribbon and adhered it around the top with a couple glue dots. the glass paint cures by air in a few weeks, so you can safely wash it, or you can cure it faster in the oven. click here to see another peach jar that i painted with a self-adhesive silkscreen. my head is spinning with all kinds of cute ways to paint these jars to use for storage, too! and now for the giveaway! our friends at plaid provided me with a generous shipment of martha stewart crafts products for a marketing campaign i participated in. i'd like to share some with one lucky winner! this valuable prize package contains a glass spray paint kit, a set of alpha adhesive stencils, two bottles of glass paint, plus two bottles of liquid gilding paint. just leave a comment here to enter and i'll draw one comment at random to win! deadline to enter is 10/25/12 - good luck! wow, wow, wow! i've been having so much fun with my giant box of stencils, silkscreens, and paints by martha stewart crafts from our friends at plaid. scroll down to the bottom of this post to watch my oh-so-dramatic box-opening video i made when my shipment first arrived...and the falling in love part is all true, baby. there is just so, so much inspiration in her product line! 1) i don't have a formal dining room, but i have a tall, prominent, and empty pub table in my family room that was just crying for some adornment. 2) i'm trying to make a dent in my fabric stash, and this autumn-themed layer cake (a coordinating set of 10" fabric squares) was just begging to be ripped open and run under the sewing machine. then i decided i wanted to try martha's stencils and silkscreens with her glass and craft paints on three different surfaces—fabric, paper, and glass. 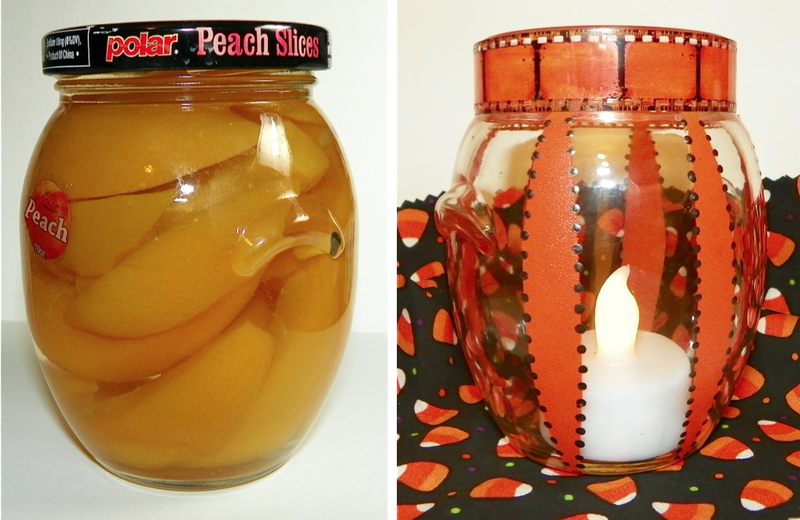 so that's how i ended up creating a patchwork table runner, a poster board pumpkin pedestal, and a tealight candle holder (upcycled from a cute little glass jar of peaches). click on the pics to enlarge. • remember when stenciling—less is more! too much paint can seep under the stencil and ruin everything...the dauber should seem almost dry on the surface, but there is plenty of paint inside that sponge tip that will come out nice and even as you tap (aka "pounce") straight up and down. i painted the pumpkins solid orange, then came back after they were dry with a small brush to paint the stems green. i wanted to really glitter up the leaves. i started by blending a little red glitter paint into yellow, but since stenciling requires a lighter application of paint, i couldn't get much glitter in there. i decided to switch to sprinkling gold glitter, which needs more wet paint to hold, but i didn't want to risk seeping at the stencil edges. so after lightly stenciling the leaf, i removed the stencil, added more paint with a small brush, and then piled on the sprinkly sparkly! after everything was dry, i gently heat-set the painted areas with an iron (medium heat), using parchment paper between the iron and the fabric. the self-adhesive silkscreens have beautiful detail and are super easy to use with martha's little squeegee brushes. both are flexible enough to use on curved glass, although i still secured the edges of the silkscreen leaf with painter's tape to make extra sure there'd be no shifting, which also gave me more space around the edges for paint overflow. after silkscreening my leaf on the outside of the jar with opaque glass paint, i used my finger to dab a little gold craft paint inside the jar to give the leaf a little transparent glow of color. safety first...i recommend using battery tealights instead of real candles, so as not to burn the paint on the inside, plus these peach jars are probably not made from tempered glass. the silkscreens and squeegees work great with craft paint on paper and fabric, too (oops, I used glass paint on the fabric, but guess what...it's just fine). for my pumpkin pedestal, i alternated a leaf stencil with a few different leaf silkscreens in different colors on a long strip (approx 6"x20") of black poster board. i glittered the stenciled leaves here too, except i left it in clumps for extra texture and contrast. i also tried a two-tone striping effect on one of the silkscreened leaves which i think turned out so pretty! once the poster board was dry, i lightly scored the back side to divide it into four even sections, then folded the strip into a square and taped the edges together on the inside. i placed a cup inside it that was almost the same height, laid a couple pieces of folded fabric down, and set my pumpkin on top. i'm in love, love, love with all of the martha stewart crafts stencils, silkscreens, paints, and tools...they are so incredibly easy to use, and you get such amazingly gorgeous results. i will definitely be screenin' and stencilin' up a storm for a good long while!! and now for your viewing pleasure...the opening of the martha box. please visit the plaid website for loads of inspiration. be sure to check out all these martha-mazing projects, too!